The moderate storm is expected to last two days and could bring up to another two inches of rain. 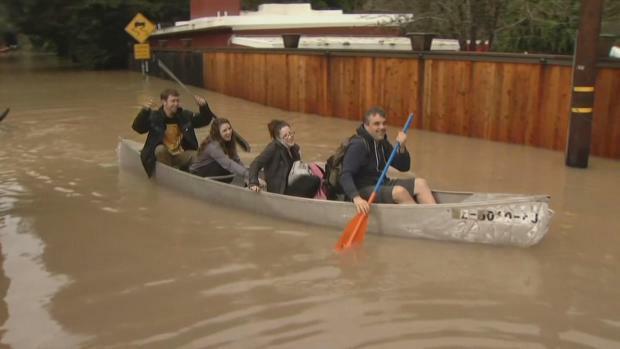 A new storm pelting the Bay Area continued the widespread wet weather the region has seen over the past week, prompting more floods, high-wind warnings, road closures and a host of other problems. The moderate storm moved into the area on Tuesday and is expected to last two days. NBC Bay Area Chief Meteorologist Jeff Ranieri said the latest storm could bring up to another 2 inches of rain and wind gusts at 20 to 40 mph. With the Bay Area already saturated from a powerful weekend storm, rivers, creeks and streams across the region were on the rise again, Ranieri said. Flash flood warnings were in effect late Tuesday for Alameda and Marin counties. A flash flood warning was also issued for the San Lorenzo River in the area of Felton Grove and Paradise Park in Santa Cruz County. Flood warnings were in effect late Tuesday for Napa, Santa Clara, Solano and Sonoma counties. The storm caused a massive blackout in Gilroy late Tuesday night, as about 20,000 PG&E customers were without power, according to Gilroy police. PG&E did not have an estimated time of restoring the power. Meanwhile, the Los Gatos Creek trail on Tuesday looked like a rushing river, with more than 3 feet of water covering the popular bike bath. Water was spilling into the creek from the overflowing Lexington Reservoir south of Los Gatos. The storm also battered the Santa Cruz Mountains, an area that has already taken a beating this week. Caltrans crews worked to clear debris, including fallen trees, on both sides of Highway 9 near Felton and were removing a large tree blocking Highway 17 late Tuesday night. BART passengers were stuck in a train late Tuesday when a tree fell onto tracks between the Daly City and Balboa Park stations. The transit agency said the incident sparked major system-wide delays. 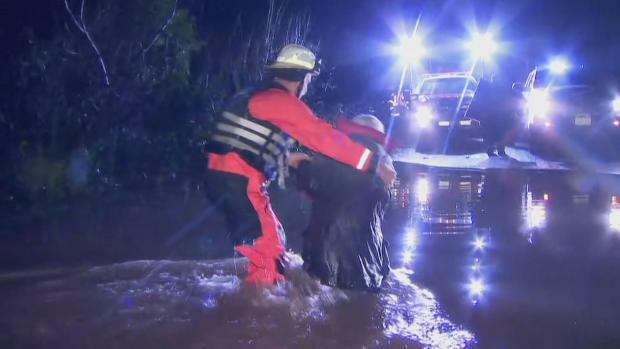 An elderly man was rescued from the rising Russian River late Tuesday night and an NBC Bay Area crew helped him reach safety. Cheryl Hurd reports. The Russian River was on the rise again Tuesday and expected to reach 37 feet — 5 feet above flood stage, which would trigger "moderate" flooding in low-lying areas near the river. The river, which is already above flood stage, has left some campgrounds, cars and trailers underwater. Emergency responders said it has the potential to cause even more serious problems. "We're taking this serious," said Spencer Crum with the Sonoma County Sheriff's Office. "We have boots strategically placed throughout the area for evacuations. We are taking all precautions on this one." The river is expected to crest on Wednesday and people who live in the area are getting anxious. "I'm terribly worried," Sonoma County resident Kate Basey said. "It's been a couple of days now and it's supposed to go up again tomorrow." A popular link to the Tri-Valley area, Niles Canyon Road, was shut down late Tuesday night as Caltrans crews scrambled to clear a mudslide. Earlier Tuesday, Interstate 880 in Oakland was shut down in both directions at High Street for about an hour due to downed power lines on the freeway. Heavy winds also toppled more trees throughout the East Bay. A massive heritage oak tree fell near Danville in Contra Costa County and significantly damaged a home and three vehicles. In neighboring Walnut Creek, emergency crews responded to another downed power line caused by fallen trees, prompting thousands of residents to be without electricity. Trees on Tuesday morning also fell on a San Francisco housing project, causing a temporary gas leak and evacuations.